This stuffs good on almost everything. Wondering what to do with those slightly bruised and past-their-prime apples? Make this topping with ingredients on hand. This delicious cooked topping partners perfectly with oatmeal, pancakes, muffins, or yogurt. Or try this spectacular dessert: a layer of homemade soft oatmeal cookies, vanilla ice cream, and hot apple topping. Decadent! Peel the apples and cut chunks into a saucepan on Medium heat. 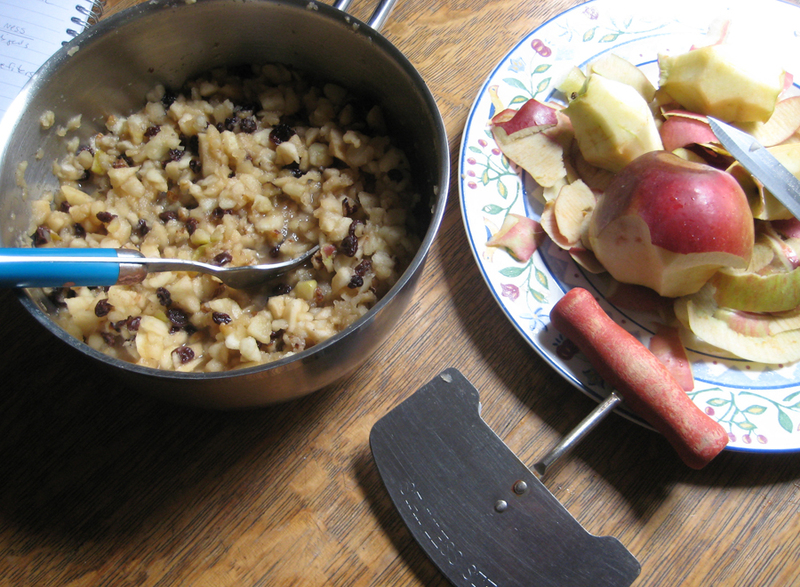 Then attack the apple chunks in the pan with a pastry blender until they are more finely chopped, about 1/4 to 1/2 inch pieces. Add the other ingredients and simmer and stir until the mixture is thickened and the apples are tender. Keep finished topping in the refrigerator. Enjoy hot or chilled. Currants just look prettier, but raisins will do fine. The amount of sugar I used made it plenty sweet: your friends who are used to processed foods will even like it. You can easily reduce the sugar for a healthier topping. Next postThe Mediterranean Diet: Salmon and Pesto and Flax, Oh My!